We will have yarn and fleece for sale. You don't have to wait for a special event to come by and vist. We would love to show you the animals on the farm. 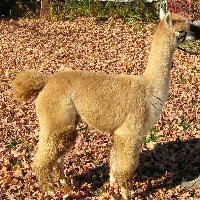 Maine's Bellemont Farm Alpacas is a small huacaya farm, quietly building a herd of distinction. PPPeruvian Grand Master, Evander, Peruvian Silvio, Coyo Destini, Bolivian Black Thunder, Yupanqui and Request the Best, White, fawn, brown and grey. We love to share our interest and experience. Come visit. Located in the Western Foot Hills of Maine, we are a short stop on the way to Sunday River ski area, the White Mountains and Fryeburg Fair. What I found most helpful when we were trying to decide whether or not to invest in alpacas was to go to alpaca web pages and read individual stories about how and why people started with alpacas. Check back and I will be doing the same for you, updating the "News" and "Our Story" pages. Alpacas are just one of our ventures. Visit or return to Shaker View Furniture. Kokopelli's Theresa has matured into a handsome girl. Sally, a gorgeous dark brown female, from Kezar River Farm has joined us for the summer to be bred to Thunder. Don't be afraid to ask about paying on time, trading or working out a barter arrangement. That's how we obtained a breeding, a herdsire and all the logo wear we could ever want. Call us toll free 866-539-8172 or .